OK. So this movie, Happy Feet, is about a penguin, see. But he's different than all the other penguins on his iceberg. They sing. He dances. This sort of difference in real life would lead to a little tutorial on the rules of natural selection. But this is an animated movie, hitting theaters just in time to cash in for the holidays. It's a movie with a message or three. It's rated PG, which, parents of young children should be reminded, is definitely not the same as being brought to you by the letter G! Happy Feet doesn't lack for digital thrills and feats, romance, affirming relationships, terror, hope, and of course the de rigueur youngster, an upstart penguin, who saves the day and overturns the Bedrockian thinking of his elders. And all it takes, in case you've not yet guessed, is feet that just won't quit dancing. Mumbles, voiced by Elijah Wood, is the hero of the story. He is one of thousands of Emperor Penguins on his ice floe who must find a mate by singing his own special song, but even a cranky voice coach can't transform his awful voice into easy listening. As any compassionate teacher will tell conferencing parents, acted by Nicole Kidman and Hugh Jackman, every child is gifted in their own way. Mumbles' gift, huge tapping feet that dance out his joy, and love and ultimately a trans-species message that saves the day, earn ridicule from his peers and attract the wrath of the governing penguins who make him the scapegoat for their dire lack of fish. The kid can't help himself, though, he's gotta, well, you know, dance! From the moment Mumbles emerges from the egg, his feet barely stop moving. Anyone who's seen Savion Glover, tap dancer extraordinaire, will recognize his unique sound and style even when it's a penguin performing. Using motion-capture techniques to animate Mumbles' steps, it's unmistakably Glover we see and hear on screen. His website, an auditory hors d'oeuvre, samples the sound of his tapping. Even over a darkened computer screen, the huge life force of his steps is thrilling to hear. Seen as Mumbles, wearing his heart on his feet, so to speak, the power of dance as message, is clear. Happy Feet is a quest movie. When Mumbles leaves home he comes of age in the process of surviving his adventures and saving his flock from starvation. He discovers "Hispanic" penguins, one of them Ramon (Robin Williams), who love what he's got, the slickest dance moves on the block. To them, he is Señor Suave and they're more than ready to buddy up on his most excellent road trip. It's on the journey, where as any adolescent in a story must be tested, that Mumbles and his Adelie Amigos roller coaster on icebergs and narrowly escape terrifying attacks of a bloody-mouthed Leopard Seal and Killer Whales hunting their prey – penguins! Especially disturbing is Mumbles' imprisonment in a zoo where he seems have turned his face to the wall and given up. Swimming sequences like updated bubble dances from the Disney classic, Fantasia, and animation of feather, facial expressions and movements, are astounding for their detail. Yes, yes, we know it's all digital, but how did Animated Logic, the studio that created Happy Feet, do it? Finally though, Mumbles returns home, wins the girl, saves the day, is the hero. All of the penguins dance together in a massive drill team formation that I wished would never end. Precision combined with percussive dance is a compelling combination. 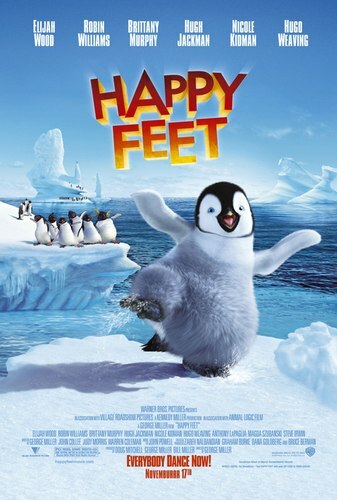 In fact, the soundtrack of Happy Feet featuring performances by Prince, Chrissie Hynde, k.d. lang, Pink, Yolanda Adams and many other singers, is so danceable that it's hard not to have happy feet of one's own through this incredible animation.